This online training series was designed to help people with disabilities think about their integrated employment options, understand employment supports, and create a plan to achieve their integrated employment goals. There are 12 learning modules, which you can watch by clicking the links below. Start with the introduction so that you can learn how to use this learning series. These learning modules were developed by Shannon Munn-Huff and Nancy Farnon-Molfenter through InControl Wisconsin with funding made available from the Wisconsin Board for People with Developmental Disabilities. Special acknowledgement and thanks go to Troy Thill, Learning and Development Specialist from The Management Group, Inc. who expertly handled the technical details and production of these modules. 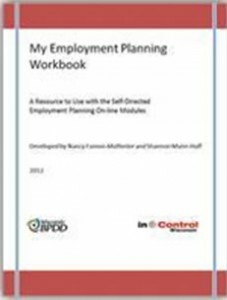 This module explains the purpose of the Self-Directed Employment Planning series and how to go through the information you will watch in modules 1-10. Start with the introduction module before watching modules 1-10. In this Module, you will hear about some laws that protect the rights of people with disabilities to live and work in their communities. You will also learn why some common myths about employment for people with disabilities are not true. This module will help you think about the good reasons you want to work and help you understand that you need to do some planning to find the best job match for you. In this Module, you will learn about the options of working for someone else or working for yourself. You will also hear about some good reasons to work and the benefits that getting a job can bring you. Those include: being a contributing community member, having more money to spend, having better physical health, having better mental health, and getting to know more people. In this module, you will learn some ways that you can identify your interests and skills, determine your preferences, and consider how you might need support at work. These are important things for you to think about as you develop your employment goal. In this Module, you will learn some strategies to address common barriers to employment, including lack of work experience or uncertainty about what to do for work, the need for training and education, transportation options for work, and maximizing your independence with assistive technology. You may only experience one or two of these barriers. If that is the case you can skip to the section or sections that apply to you. In this Module, you will learn a little about Work Incentive programs for Supplemental Security Income (SSI) and Social Security Disability Insurance (SSDI). Work Incentives help you to work and earn money, while keeping the benefits you need. You will also learn how to get help to learn more about your benefits and to use the Work Incentives available to you. This information should help you decide how much you want to earn. In this Module, you will learn about the people who can be part of your employment planning team and help you with the steps of finding, learning, and keeping a job. The steps of job-seeking will be described and the different people who might help you with each step will be discussed. You will also hear about a good way to work as a team to reach your employment goal. In this module, you will learn about the different types of supports available to help you with your job search process. You will get an overview of commonly used services people use to plan for and get employment. This overview will include the names often used to talk about employment supports. You will also have the opportunity to think about what services might be best for you based on your employment goals and support needs. In this Module, you will learn about the resources that might be available to you and how employment supports and services are funded. These resources can be blended in a way that creates a whole plan that meets your employment planning needs. Although support systems and the rules for funding are always subject to change, this module will help you to understand the basics about funding sources for employment supports, and the ways you can access those resources, and advocate for what you need. In this Module, you will learn about working with employment service providers. With the resources available to you, you can hire an Employment Support Agency (sometimes called a Supported Employment Agency) to help you with the different parts of your employment process. Such agencies, with expertise in assessment, job development, job training, and ongoing support services, are available in most parts of Wisconsin. In this Module, you will learn about another way that you can get the support you need to implement your employment support plan. 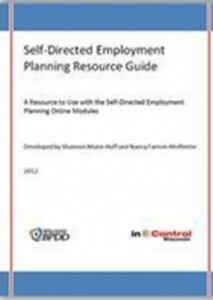 You can use Self-Directed Supports to hire one or more individuals to help you with different parts of your employment support planning process. These people are sometimes called individual employment supports. This conclusion module will review all of the questions in the workbook. If you have already completed all or most of the workbook sections, you can look through your answers while you view this module. If you have not yet completed some or all of the sections of the workbook, you can complete the workbook now as you go through the slides of this module.